China has reacted angrily to a US ban on seafood products, after American authorities claimed they included antibiotics banned in the US. The head of China's health inspection watchdog, Li Changjian, called the ban indiscriminate and unacceptable. 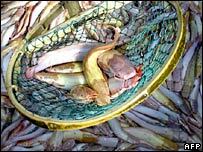 The US Food and Drug Administration (FDA) said on Thursday it would stop shipments of catfish, basa, shrimp, dace and eel. It is the latest in a number of US warnings about Chinese products. Mr Li urged the US to "properly deal with the problem as soon as possible". He had a phone conversation with US Health Secretary Mike Leavitt, urging the US to deal with the issue. The ban is not imposed on food which has already been imported into the US, only future shipments. In what is thought to be a response to the US move, Chinese authorities this week seized two shipments of American food, saying they were substandard.